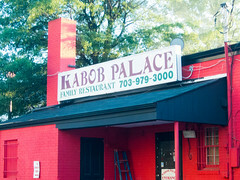 Approaching Kabob Palace from Crystal City or Jefferson Davis Highway, it’s not an impressive sight: it’s basically a slightly run-down building with a simple “Kabob Palace” sign and a smaller “Enter here” sign. 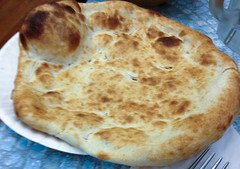 The reason for this is that if you are approaching from this direction, you are actually coming in the backdoor of Kabob Palace (the real, nicer entrance is on Eads St), but you soon fine yourself in a fairly elaborately decorated dining area, although with a bit of a fast-food vibe. 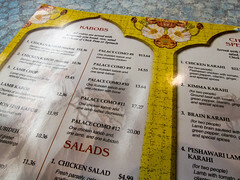 Sitting down and looking at the menu (which seems to follow the general rule of kabob joints in having a lot of minor misspellings, such as “Como” instead of “Combo”), the selection is primarily, well, kabob, with all the usual variations: chicken (bone-in or boneless), lamb, and various ground meat kubidehs, or combinations thereof. They’ve also got a nice selection of karahi dishes, and some occasional specials like a daily curry special, and a vegetable of the day. 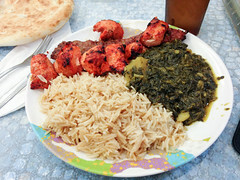 Myself, I decided upon a boneless chicken kabob special, which came with rice and a side vegetable, for which I chose spinach. After a brief 5 minute way, my kabob arrived, and for the $12 I paid for it, this was a very ample portion of chicken kabob, a small mountain of rice, a deep pile of spinach, and a basket of pita bread. I was pleased with the kabob itself: the chicken was very nicely marinated without being over-tenderized, with a nice rich turmeric color and a very nice spicing, and cooked just to the point of crispy perfection, maintaining a moist interior. The spinach was very pleasing as well, a very flavorful mound of spiced wilted greens cooked just to the point of starting to fall apart. Add in some fresh, crispy pita bread and some rice (which was, well, rice, nothing fancy there), and this was a very generous portion for a reasonable price. In a city with well more than its fair share of kabob places (off the top of my head, I can think of at least a dozen, including Kabob Bazaar up in Clarendon, which I prefer by a slight margin), Kabob Palace holds its own, offering a very pleasant, generous, and afforable alternative to the expensive chains of Crystal City. For our last full day in Valencia, the weather had cooled off a few degrees to be just “pleasantly warm”, so we decided it would be a good day to go check out the beach and go swimming (I had been to the beach twice before, but at night). After a few hours of swimming and relaxing on the sand, we needed a light lunch, so we decided to go walking. The southern end of Malvarossa beach is actually several blocks of restaurants all packed together (including the very nice La Pepica that I had eaten at two nights before), but we ended up instead walking out on the breakwater of the Port of Valencia, where we came across 39º27N, and decided to have a light lunch there.